Ogham is an ancient script and it is the first know written language of Ireland. The name Ogham comes form the word Ogma meaning the Celtic God of Elocution or fine speech. The Ogham alphabet consists of groups of lines from one to five set across a vertical stem line. Each group represents a different letter. Ogham was used mainly for commemorative inscriptions, it is read from bottom to top, it is a phonetic alphabet. Ogham probably originated in south western Ireland around Cork and Kerry. By having your name inscribed in Ogham you can share a piece of Ireland’s history. Today we continue this great tradition and you may have the name of your choice engraved in Sterling silver, 10k, 14k, or 18k gold. Each piece is handmade in Ireland. Ogham names can also be engraved on rings, earrings, bracelets, bangles, brooches and for the men on cuff-links, tie bars, tie pins. You can also have your Ogham design set with a gemstone or a birthstone if you would like to make the piece extra special and unique! The following is important information about Ogham. The letter F and V are the same in Ogham. The letter J and S are the same in Ogham. The letter W is substituted for the letter U. The letter X is substituted for the letter K. The letter Y is substituted for the letter I(i). Pillar stone with Ogham Script and Roman capitals, from Killeen Cormac, Colbinstown, Co.Kildare. Late 6th to early 7th century A.D. 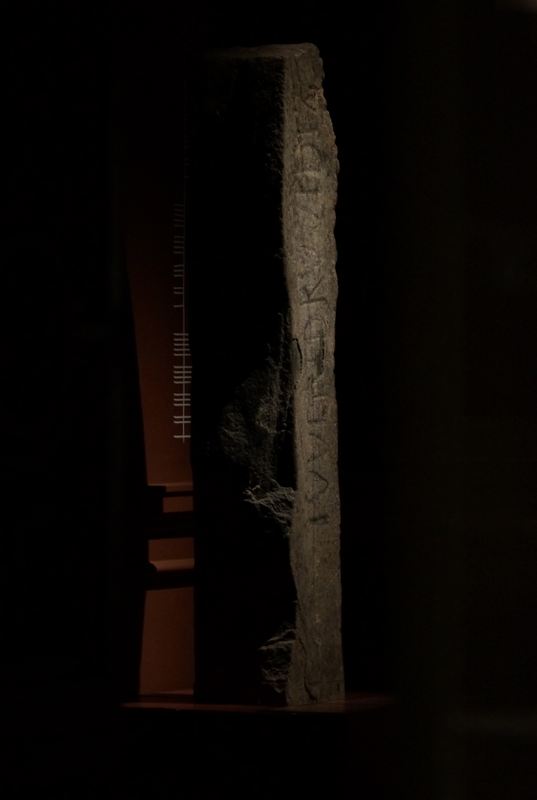 This is one of the two Ogham stones on show at The National Museum of Ireland, Kildare Street, Dublin. It is only a two minute walk from our shop. The museum is not very large – but it is lovely. If you visit Dublin, the National Museum is highly recommend and is free to visit.